It's been too long since I truly updated my wardrobe and one of my newest goals for 2019 is to have a wardrobe of clothes I absolutely adore. My aim is to go through the whole thing and have a huge clear out of anything I don't feel is versatile enough, that doesn't make me happy or that I don't truly love. I feel like I need to start again, especially since I'm rekindling my love for fashion. It's been a while since I shopped too and my recent shopping trips have been about adding newness and versatility in my wardrobe. 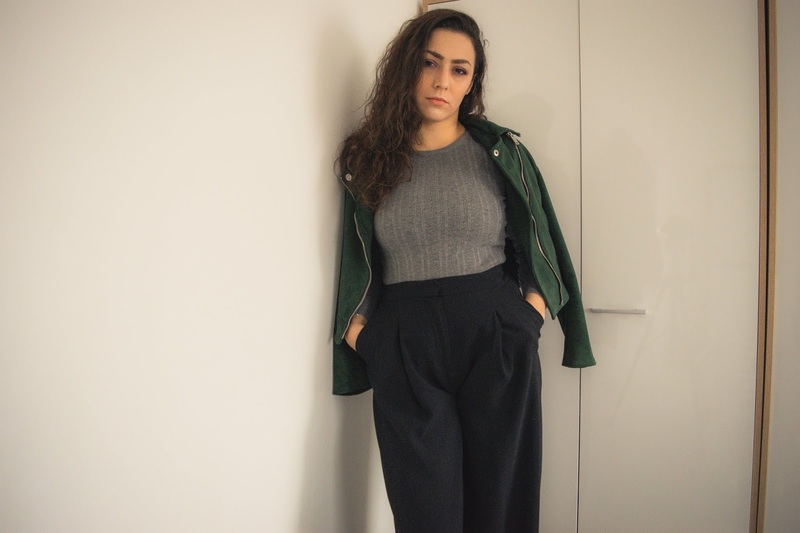 Oddly, most of the pieces I've bought have been skirts and trousers, but I've always drawn to interesting bottom pieces and pairing them with basic tops. 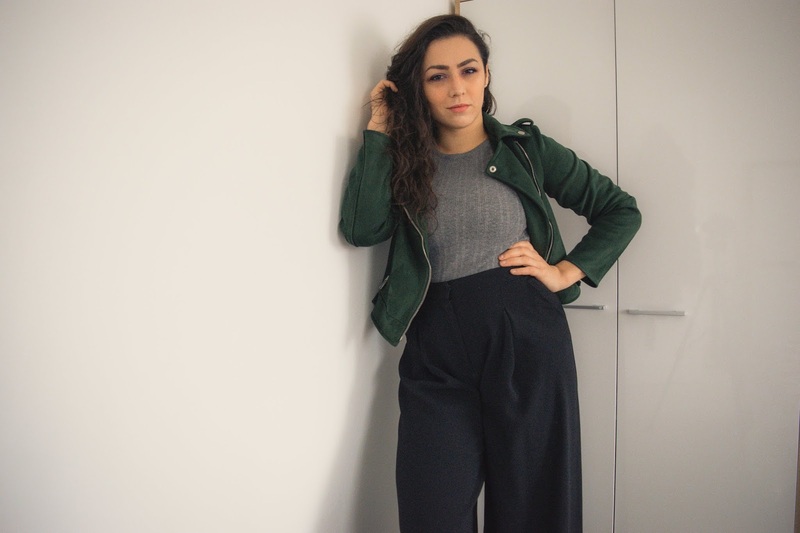 One thing I picked up in the River Island sale are these high waisted wide leg trousers which are perfect for trendier work wear looks. 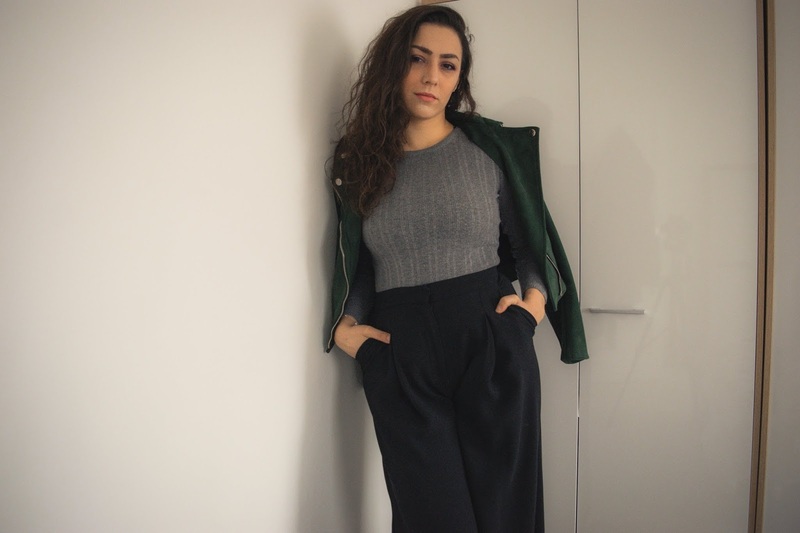 Black trousers are perfect additions to any wardrobe no matter what their style. Whether they're skinny, tapered, cigarette or wide leg, they give you the ability to be experimental and playful with your outfits: make them smart and sophisticated or smart casual. I thought about the many ways I could style these and just had to have them. This isn't the last you'll be seeing of these. 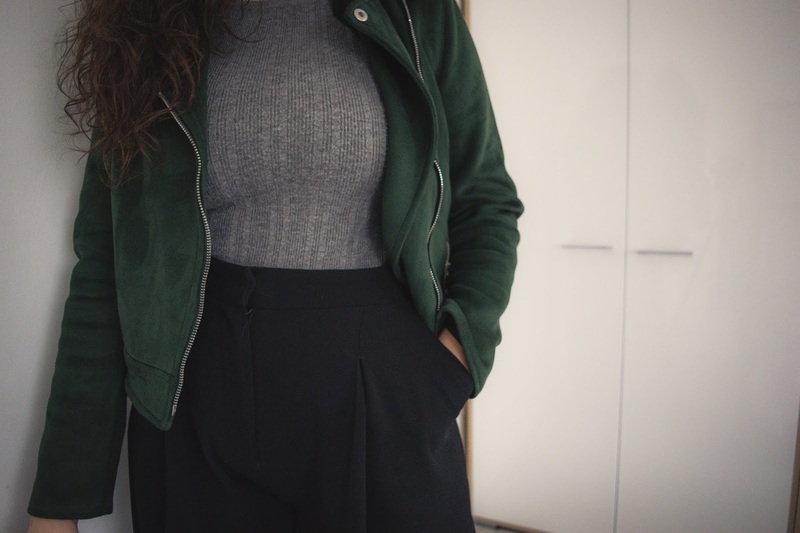 I played it safe for this outfit and went for my favourite grey, light knit top and my faux suede green biker, both from Primark. 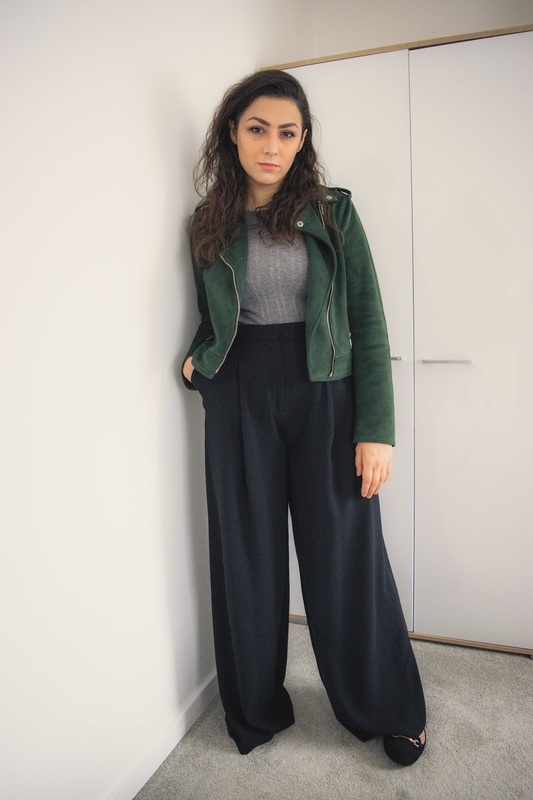 I feel like I'm a little bit of a newbie when it comes to styling a pair of these because I've only ever styled my summer wide leg trousers with crop tops back when I was brave enough to, but I did have a little play with how to style these beauts. You might see a post where I wear it with a leopard print bodysuit soon and I'm also thinking about styling it with some shirts for a really smart work wear look. I'm really excited about fashion this year, especially since I've already started to build my new wardrobe with pieces that I know I'm going to love wearing and I'm excited to style and blog about. Here's to a 2019 filled with fashion and style!